On Monday we completed the second of two extremly successful “Selling SAP on Azure” events exclusively for partners. 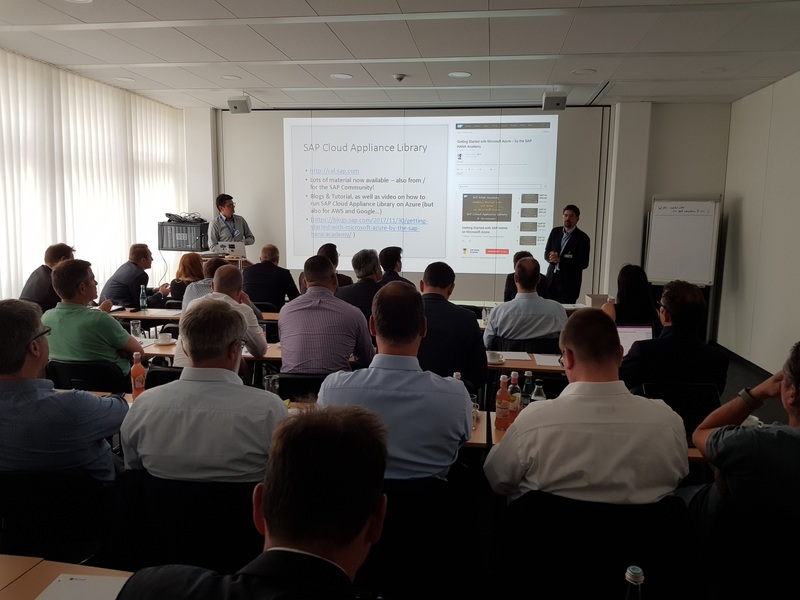 In the past my colleague Robert Boban and I have done several technical training sessions for partners (mostly in Walldorf) which are typically very well attended (see also SAP on Azure PPE Workshops). This time we wanted to look more at the Sales points of view. We see a LOT of demand for SAP on Azure. At SAPPHIRE we just learned about the importance of the S/4HANA, C/4HANA, the SAP HANA Data Management Suite and of course the SAP Cloud Platform which brings all of this together. But data and tools not only come from the SAP world. There is a lot of interaction with other products, processes and services — among them of course from Microsoft. Customers come with different ideas and approaches on how to leverage the integration of their SAP workload with Microsoft Azure and how the cloud can help customer not only with the first POC for S/4HANA, but also with big production workloads. Microsoft Azure provides a perfect solution for this: starting from simple Development or Test scenarios, to Training systems up to really big productive HANA workload of up to 24 TB of memory in Azure. We see all kinds of projects running. The “fear” of running SAP on Azure is also long gone and customers like SAP, Daimler, Accenture, Rio Tinto or Co-op are already running their SAP workload in Azure. Since we from Microsoft “only” provide the infrastructure we rely heavily on partners to help our customers get the best out of their SAP and Microsoft investments. Luckily Microsoft has a huge list of extremely good partners and no matter what customer is approaching us we can typically provide the best fit. 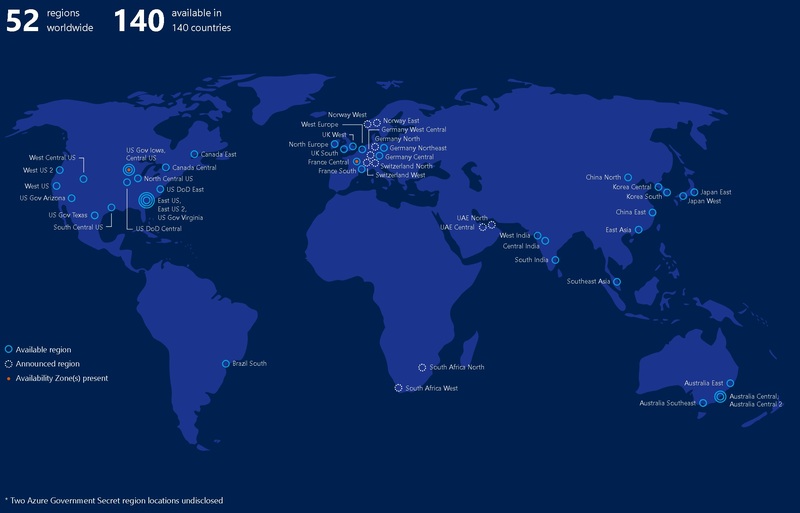 These partners can be global partners, who support global customer who run their business in several of our over 50 Azure regions spread across the globe or local partners that are well known in a region and provide a trusted face to the customer. When working with SAP on Azure there is typically a new challenge for partners: you not only have to know Microsoft Azure, but obviously also SAP. Although we have already quite a few partners that are already really good on both these topics, we often see extremely experienced SAP partners already working closely with customers that just start their journey to the cloud. 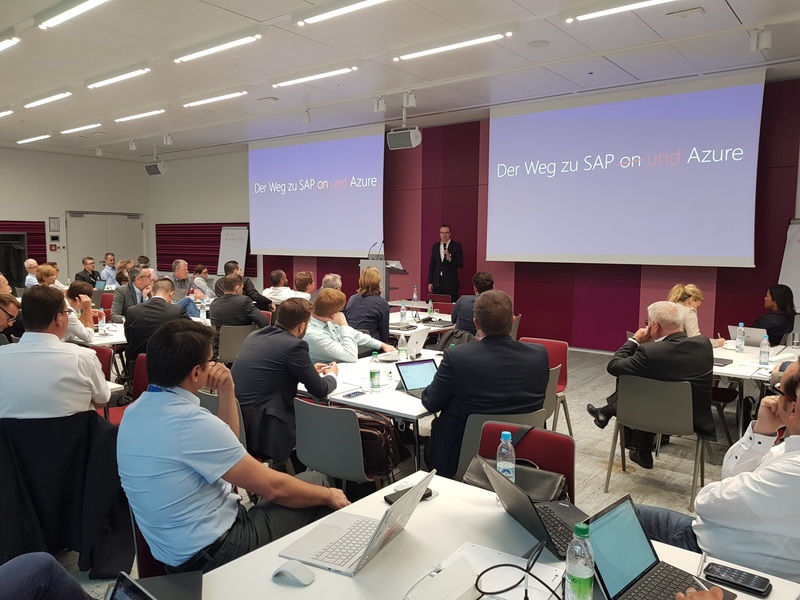 The idea of our first workshop in Walldorf last week was then to address these partners: what does Microsoft offer in the area of SAP on Azure? What are the unique selling points? What are integration options? How can you leverage Office 365 and SAP? Why should a customer choose Azure for their business critical SAP workload? How can Microsoft support also new partners to benefit from the trusted partnership between SAP on Azure? Who are the contacts that you can reach out to get you started? And most importantly: what is in it for you? 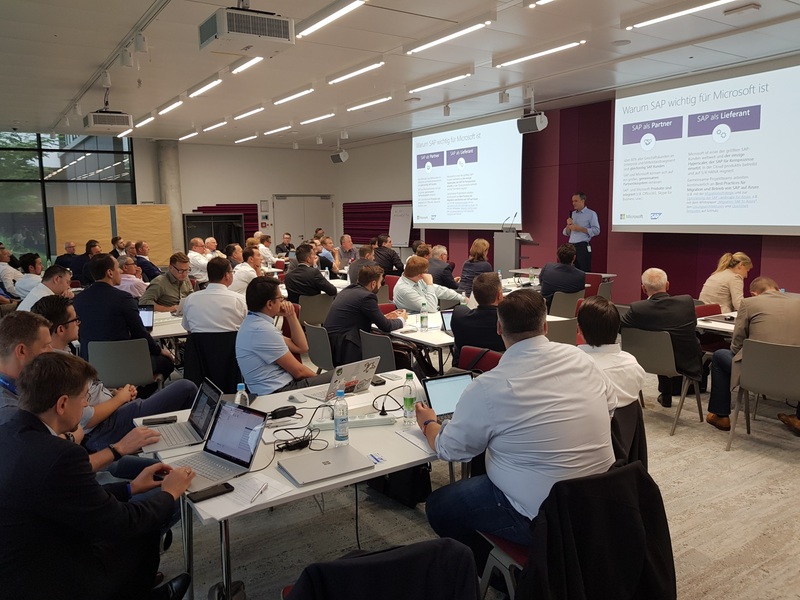 Unfortunately we had only about 50 seats available in Walldorf and the session was soon booked and we had to put partners on the waiting list. The event then was super packed and my colleagues Martin Sudbrock, Robert Boban, Domini Petrak, John Lavallee and I took the opportunity to present my favorite topic. We attracked a lot of new partners and for me personally it was great to see some “old” partner-friends from the time I was still working at SAP. I think both existing and new partners enjoyed the sessions and learned that working with Microsoft on SAP on Azure projects brings a lot of new exciting opportunities. 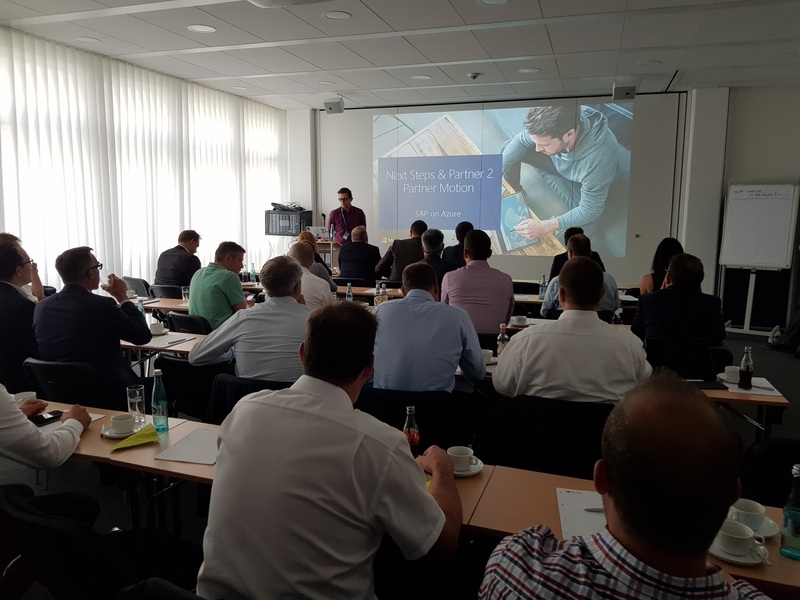 When we started planning these workshops it was clear that we wanted to start with two: one in Walldorf (Headquater of SAP in Germany) and one in Munich (Headquater of Microsoft in Germany). In our office in Munich we had bigger rooms available but even there we had to stop accepting registrations after 70 people. More people were put on the waiting list and so the event in Munich was again extremely well attended. We again started by talking about the latest announcements from SAPPHIRE 2018 (M-Series for SAP HANA, SAP Cloud Platform now GA on Azure, virtual machines with up to 12 TB of memory in Azure, see Offering the largest scale and broadest choice for SAP HANA in the cloud), discussed opportunities for purely SAP focused partners (e.g. leveraging the ABAP SDK for Azure) and outlined what it takes to get engaged with Microsoft and how we can jointly help customers make SAP run on Azure. 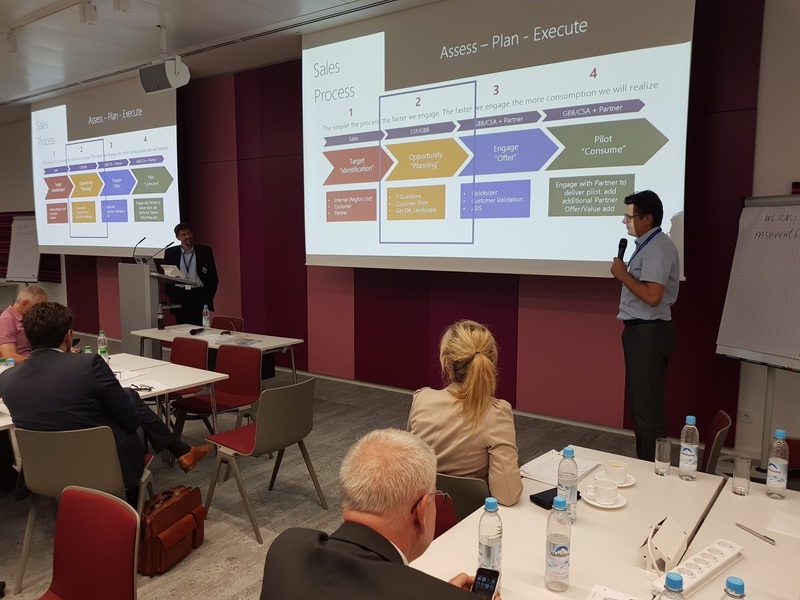 My colleague Patrick Schidler talked about the benefits of going beyond a pure SAP on Azure to SAP and Azure and highlighted again all the opportunities allow partners to help customers get the best out of their investments. After these two successful events it is clear, that we will repeat this format. Stay tuned for more announcements. If you cannot wait and want to get in contact with us (the German field), please reach out directly to me or send an email to drecruit@microsoft.com . Thanks to Holger and our Microsoft “SAP Dream Team” for leading this workshop and supporting many of our Presales Activities in Germany! SAP on Azure is a rocket ship in Germany and that is due to our great Partners in Germany. Thanks Holger for this nice blog. Is there any workshop on the topic “SAP on Azure” in SAP TechEd Bangalore this year? As soon as I have more information I will let you know!